"WELCOME TO MARS!" makes a big splash at the Beijing Planetarium. 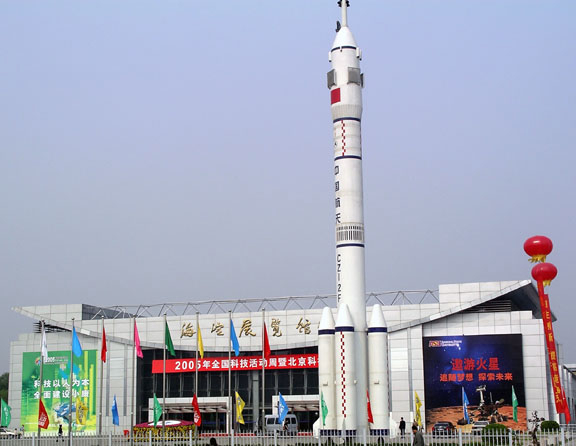 A mockup of the rocket that launched China's first astronaut stands outside the exhibit hall. ROCKET WORKSHOP. 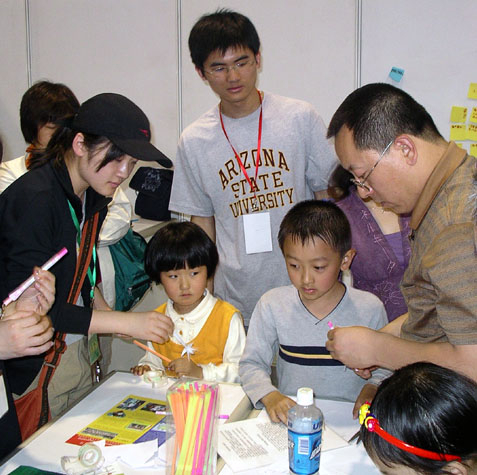 Helped by Chinese-speaking ASU students, parents and kids learn how to make pencil rockets. THE WORD FROM MARS. 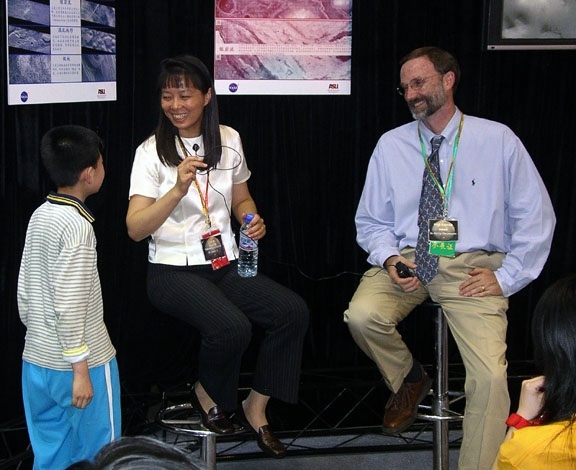 A young visitor asks "martian" Phil Christensen a question, as Jennie Si translates. 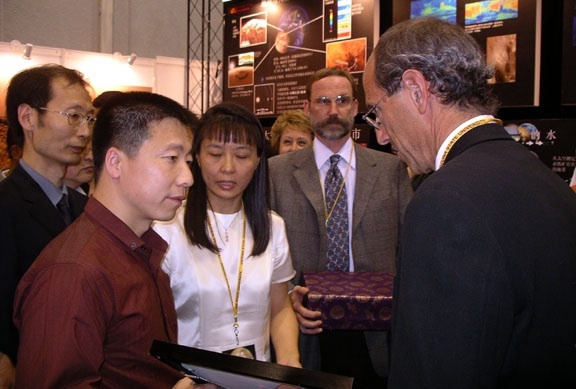 FIRST ASTRONAUT and national hero, Yang Liwei, receives an invitation letter from ASU from Vice-President for Research Jonathan Fink (right), with Jennie Si translating. 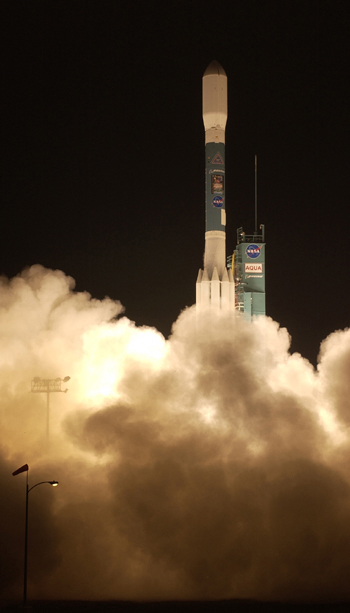 In May 2005, planetary scientists from Arizona State University's Mars Space Flight Facility took an exhibit named "Welcome to Mars!" to Beijing, as part of China Science & Technology Week. "Welcome to Mars!" featured ASU planetary geologist Phil Christensen and showcased a variety of exhibits (including two martian meteorites and an 8-foot-diameter globe of the Red Planet), plus interactive adventures aimed at the general public and students of all ages. During China Science & Technology Week, tens of thousands of Chinese citizens visited the exhibition, including national hero Yang Liwei, China's first "taikonaut," or astronaut. Thousands more saw it in the following weeks, when "Welcome to Mars!" moved to Beijing Planetarium after Science & Technology Week ended. 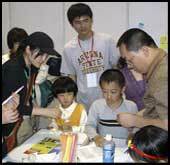 ASU is the first institution from outside China invited to present at the annual China Science & Technology Week. ASU engineering professor Jennie Si played a key role in bringing about the exhibit and making it run smoothly. While in Beijing, members of the ASU delegation also presented seminars at Tsinghua University, Beijing University of Aeronautics and Astronautics, and the China Association of Space Technology. 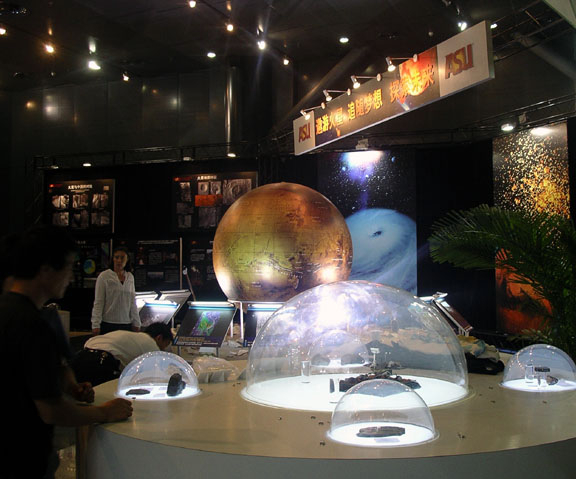 As a result of the successful exhibition and Arizona State University's on-going contacts with Chinese scientists and researchers, the official web site of the Chinese government created a special Mars exploration site featuring Mars and ASU's Mars exploration program. The new Chinese site translates features posted by ASU's Mars Space Flight Facility on themis.asu.edu.